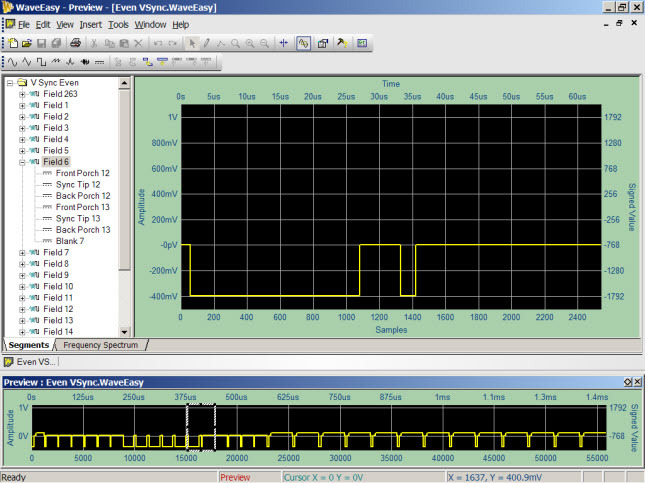 Creating an RS170 Video Signal with WaveEasy | Marvin Test Solutions, Inc.
Summary Using WaveEasy to break up complex signals into fields simplifies data entry and waveform generation. This concept is demonstrated by generating a Black & White RS170 video signal. 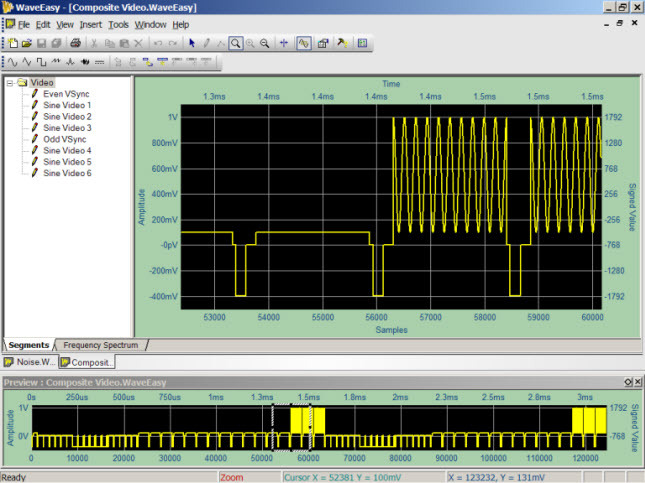 WaveEasy simplifies entry of complex analog signals by allowing the user to break the signal up into smaller, easier to define segments and sub-segments, which can easily be replicated in the pattern memory to create a complex signal. This is especially true for signals that are of a repetitive nature, such as RS170 video. 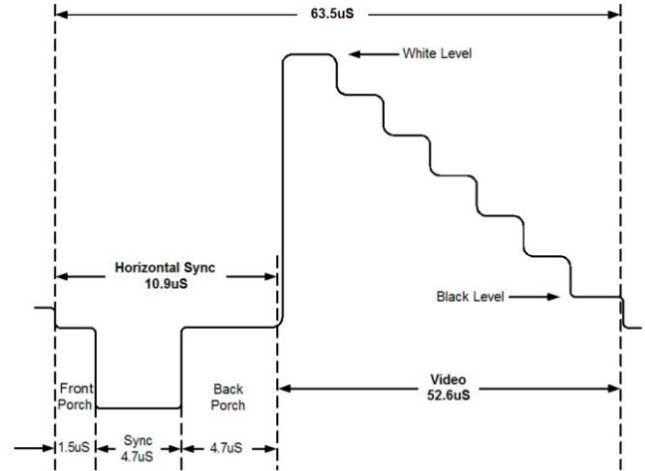 The RS170 signal will be discussed in a general sense during this article, but a full discussion of the characteristics of an RS170 signal is beyond the scope of this article, so knowledge of the RS170 signal format and timing is assumed. 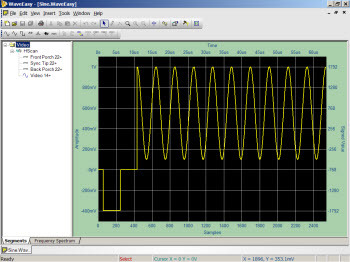 It should also be noted that examples presented within this article were designed for download to the Geotest GX1110 Function Generator/Arbitrary Waveform Generator operating at 40 Ms/S (25 nS period). For additional information about how to define waveforms in WaveEasy and load them to the GX1110 Arbitrary Waveform Generator, refer to Knowledge Base Article Q200138. The RS170 standard transmits a full image at a 29.99Hz rate. The image is transmitted in an interlaced format, with one half of the image being “painted” on the screen after each vertical retrace in an alternating Even/Odd frame format. The half-frames are transmitted at ~ 60Hz rate. 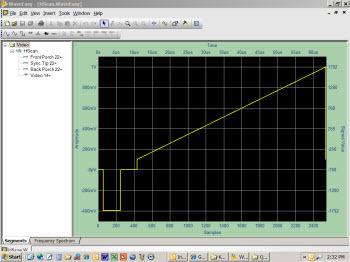 A typical horizontal trace signal is shown in figure 1 using common nomenclature. The Even and Odd vertical retrace signals, represented in WaveEasy, are shown in figures 2 and 3. To simplify their definition within WaveEasy, the even/odd vertical retrace synchronization signals are divided into 21 Segments (labeled "Fields"), each representing the time duration of one horizontal trace. These segments share many common characteristics that facilitate using standard copy/paste functions to build up similar, but slightly different wave components. In between the even/odd vertical retrace signals are the 241 horizontal trace signals that represent the interlaced image. In addition, the even vertical synchronization signal has an added one-half horizontal trace field at its beginning (labeled field 263) and its end to accommodate the one-half horizontal scan line of each image frame. The full image is composed of 21 even vertical retrace fields, plus 241 even horizontal trace fields, plus 21 odd vertical retrace fields, plus 241 odd horizontal trace fields, plus the 263rd horizontal trace tacked on to the even vertical retrace signal. This is a total of 21+241+21+241+½+½=525 horizontal scan lines – one full video frame. 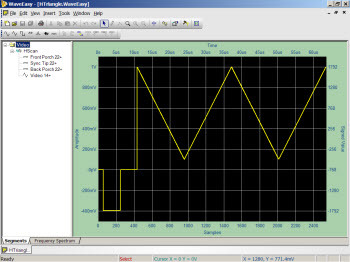 Each of the field segments making up the vertical retrace and horizontal trace waveforms are further divided into Sub-Segments, where individual wave components of each field can be defined. 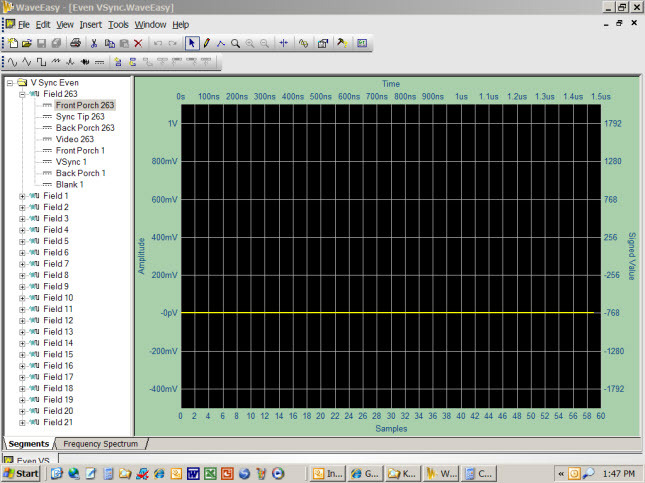 Figure 3 demonstrates this concept by defining the “Front Porch” of field #263's synchronization pulse as a 0V signal for a duration of 1.5uS (60 samples at 25 nS [40 MHz] sample rate). The composite overlay of multiple WaveEasy screen captures in figure 4a illustrates how each sub-segment of field #263, as represented by a change in voltage levels, can be defined. When arranged sequentially they produce the segment pulses of Field #263 within the even vertical synchronization waveform - figure 4b. The same process is used to define the remaining frames in the vertical sync waveforms. 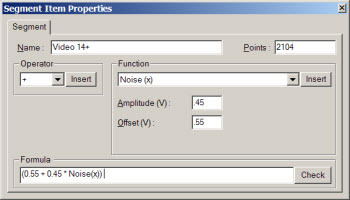 Where fields are identical to those already defined, copy and paste functions can be used to easily replicate those component waveforms. And where new pulse streams are required, sub-segments of existing fields can be copied and pasted where applicable into the new field (figure 5). 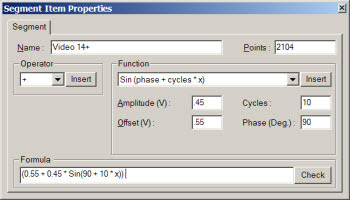 The Preview Window (bottom of figure 5) displays all segments and sub-segments of the active waveform document with the hashed lines identifying the selected segment or sub-segment. If the same waveform were used for all of the 442 interlaced horizontal traces, this sawtooth waveform will generate a dark-to-white gradient across the screen from left to right. 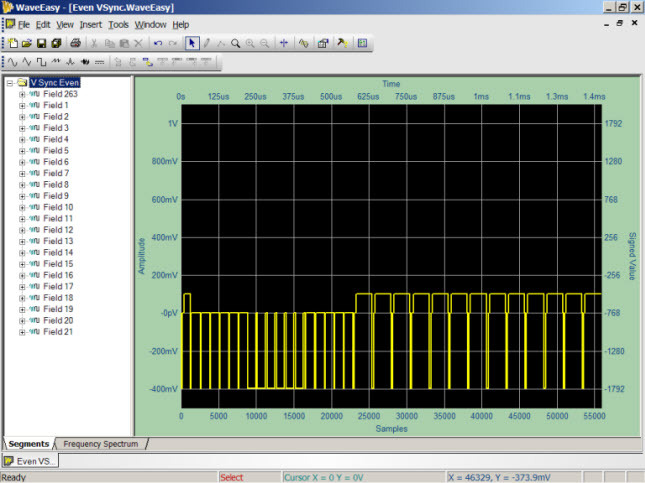 Many other simple built in WaveEasy functions can be used to create novel or useful test patterns (figures 7a and 7b). 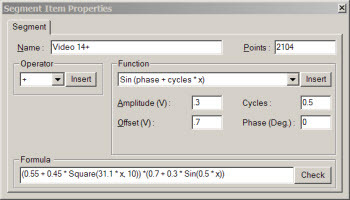 You also have access to complex functions such as Noise (figure 8a), or combinations of functions such as Square Pulses with Sine Modulation (figure 8b). The latter will generate vertical lines across the screen of varying white intensity. 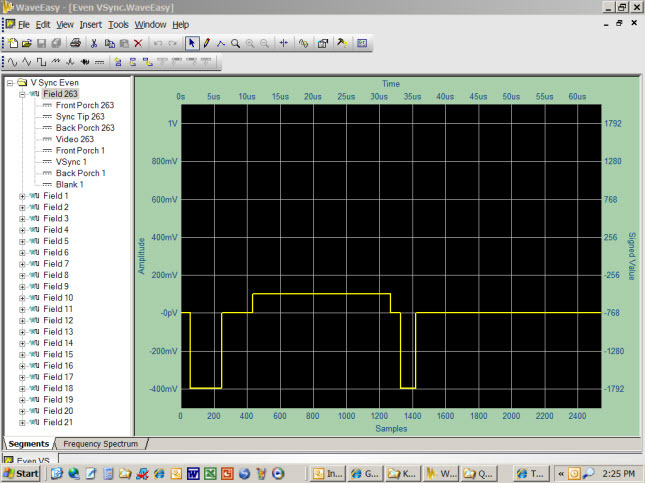 All of these component waveforms can be assembled to produce one full video frame. Figure 9 depicts an abbreviated video frame showing the full even/odd vertical sync pulses, each bracketing three horizontal traces (preview waveform image). 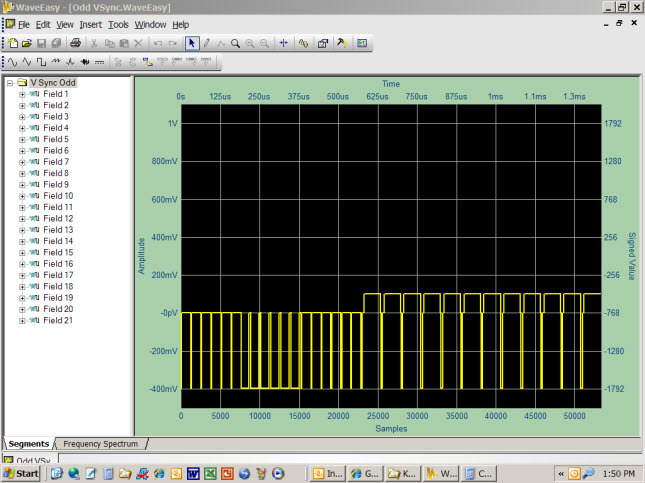 Normally there would be 241 horizontal traces in between each even or odd vertical retrace. 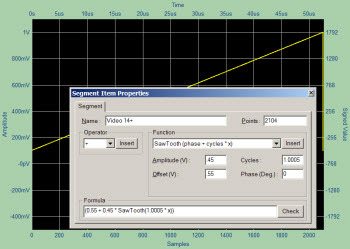 The large waveform occupying the center of the WaveEasy screen shows a magnified section of the preview waveform (hashed lines) where the signal transitions from blank horizontal traces (dark) to active video (represented by sine waves). The process of assembling (loading) these waveforms into a full video frame within the GX1110 is easily done via software using the supplied GX1110 driver functions. The sequence would be to load the even vertical synchronization waveform (55,880 samples), followed by 241 copies of the horizontal trace waveform (2540 samples each), followed by the odd vertical synchronization waveform (53,340 samples), followed by the remaining 241 copies of the horizontal trace waveform. 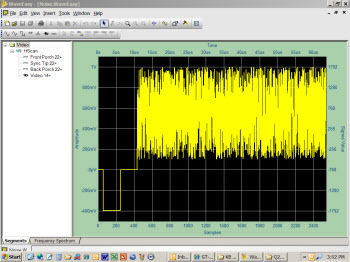 The total pattern size is 1333500 samples in duration – which when output at a 40 MHz sample rate, generates a video signal with a 29.99 Hz refresh rate – exactly as defined for RS170 video. Sample ATEasy code to demonstrate this concept is provided below.